Everyone has a preferred method for treating a hangover  Gatorade, greasy food, a Bloody Mary  but in my experience, none of these work particularly well. So when a bartender recently recommended that I try coconut water as a morning-after remedy, I was skeptical. However, since I'd been drinking everything else she'd put in front of me, I figured I'd give it a shot. To my surprise, the little juice box seemed to work. I didn't like the sweet taste at first, but I felt noticeably better within an hour. Coconut water, which is extracted from fruit too young to have formed milk, is low in calories and has no fat and a lot less sugar than most juices. But its most important attribute, at least among barflies, is that it is an excellent rehydrater. Bit of bar trivia: 10 years ago, when the U.N.'s Food and Agriculture Organization (FAO) was granted a patent  the first ever given to a U.N. agency  for bottling coconut water in a way that preserves its nutrients, an FAO official noted that the drink contains the same five electrolytes found in human blood (Gatorade has only two). He called coconut water "the fluid of life." Indeed, in medical emergencies, coconut water has been used intravenously when conventional hydration fluids were not available. Most hangovers are less dire than that, but the killer headache that follows a night of drinking is essentially the result of being really dehydrated. All those $2 Pabst Blue Ribbons act as a diuretic, flushing the water out of your body, which then has trouble absorbing more. That's where those electrolytes come in, according to Lilian Cheung, a nutrition expert at the Harvard School of Public Health. Advocates of coconut water maintain it can do everything from boost your immune system to reduce menstrual cramps, but skeptics are trying to slow the hype machine. Harvard's Cheung says there is no significant research to bolster many of the claims, including that the drink can lower the risk of cancer. 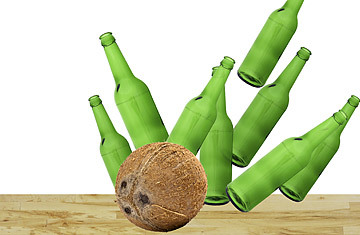 Still, coconut water's commercial success among partygoers has inspired imitators like Code Blue, an all-natural, electrolyte-laden beverage touted as a "recovery drink." A p.r. rep delivered some to my desk in a white prescription bag. The drink wasn't bad, but there is something to be said for discretion when you're dealing with a hangover at the office. The other sign that coconut water is catching on: the proliferation of coconut-water cocktails. Next round of research is on me. See the top 10 drunkest holidays.